In order to keep our schedule running smoothly and prevent unnecessary delays, we ask all clients to arrive on time for their appointments. Clients who arrive 10 or more minutes late may be asked to wait until there is a break in the doctor’s appointment schedule. Clients who are 20 or more minutes late may need to reschedule or pay a work-in fee. We require full payment at the time that services are rendered. We accept cash, check, Mastercard, American Express, Discover and Visa. In addition, we also now accept Care Credit. We can help you apply during your visit, or you may apply online for a Care Credit card in advance to see if you qualify. Active military personnel, seniors, and teachers are eligible for a 10% discount. We do not sell or give out any information to any third party vendors or internet businesses. 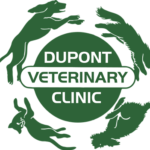 By providing your email address to our clinic, we do reserve the right to email occasional marketing newsletters from Dupont Veterinary Clinic or any of our affiliated businesses. No private information will ever be disclosed to outside parties from Dupont Veterinary Clinic. Dupont Veterinary Clinic recognizes the importance of protecting the personal privacy of its clients, its patients and those individuals who simply visit our site. Your privacy is also protected in our hospital. At no time is any information given out about a client or a pet without the consent of the owner.